Summer is coming to an end. We've plucked several plants from the garden as the first frost can come any day now. Most of the kale was cut this weekend. 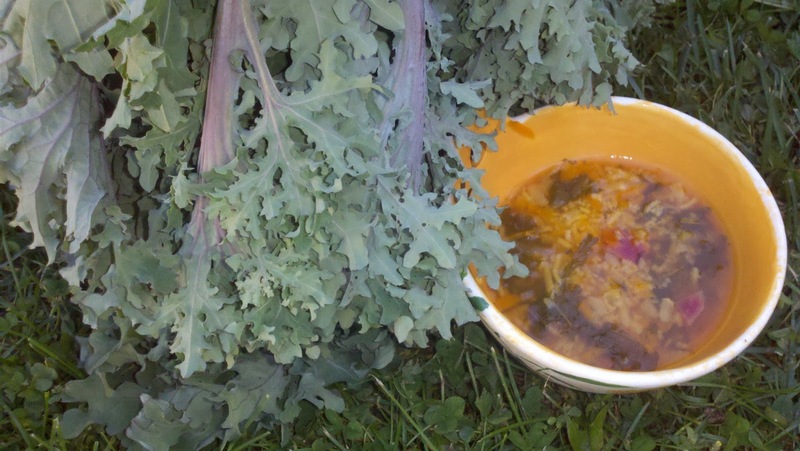 I don't need to tell you how healthy organic kale is, there are many articles on the Web that do just that. Kale is not a vegetable I knew of until just a few years ago. since, we've juiced some and shredded some to add to salads. 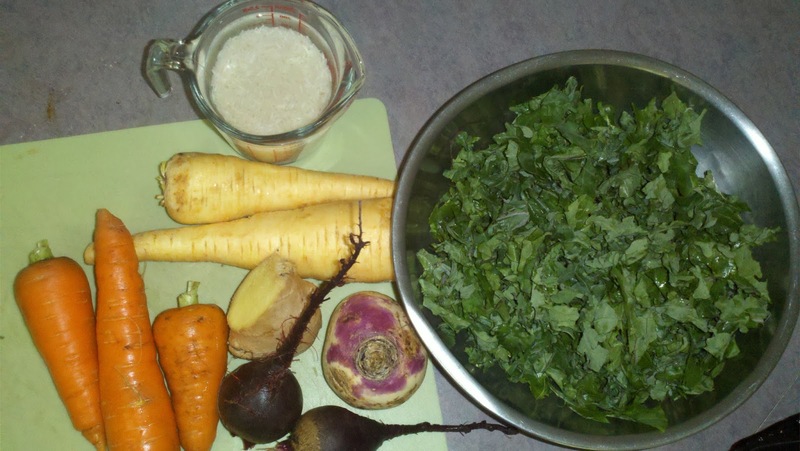 Here are my other favorite kale concoctions. In a large mixing bowl, whisk together garlic powder, sea salt, curry powder, turmeric, cayenne pepper, coriander, paprika and olive oil. Mix in kale leaves (no stems) until all coated. Spread leaves on dehydrator trays and dehydrate at 115F until crisp, like a tasty thin green potato chip! Make a raw cheese by blending 1/3 cup pine nuts, a touch of olive oil, a clove of garlic a piece of red pepper and some curry spice. Coat leaves by massaging them with the paste mixture with your hands. Dehydrate at 115F until crisp. At this temperature, your quality ingredients remain raw and thus all vitamins and benefincial nutrients, even enzymes, are preserved. A great recipe for fall and for balancing Vatta Dosha. 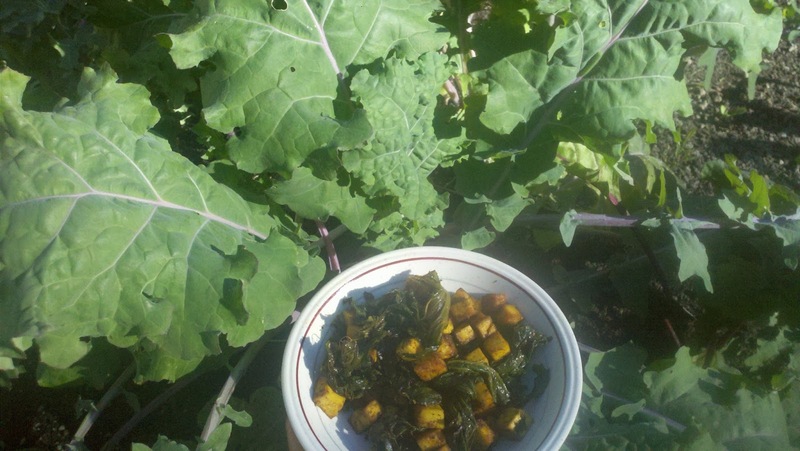 Inspired by this recipe, I used grated parsnip, rutabaga, ginger and carrot along with two small diced beets, kale leaves and 1/2 cup of basmati rice. I didn't have daikon radish or cilantro but added a bunch of parsley at the end of the cooking time. 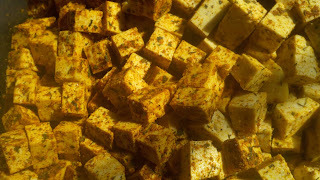 Mix the spices in an airtight container large enough for all of the tofu. Cut the tofu into small squares and place with spices. Shake to cover evenly. You can do this in advance and keep it in the fridge. To cook, heat your oil in a large pan and stir in the tofu. 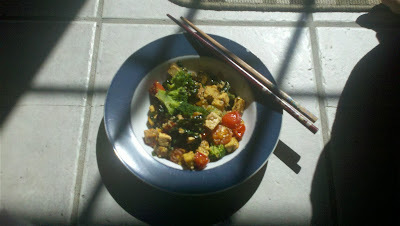 Stir it up after 4 minutes, repeat until the tofu is browned and looks crisped. Turn heat to medium-low. 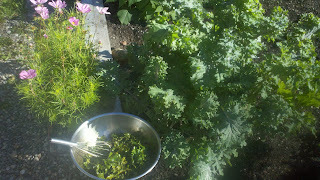 Add the kale, cover. Stir occasionally, keep covered and sprinkle garlic salt or pepper to taste. You cad add cherry tomatoes and roasted nuts as they did here. Consider serving on a bed of stringy spaghetti squash. 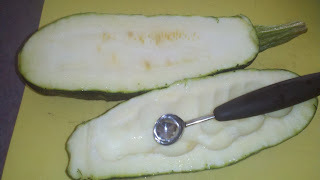 Cut a big zucchini lengthwise, seed or scoop up some flesh from the center. Sprinkle with sea salt or garlic salt and turn upside down on a clean dish towel. Heat a tbsp of butter in a large frying pan and toss in a chopped Portobello mushroom. Stir until browned and lightly crisped. Set aside. Stir-fry fresh bell and jalapeno peppers coarsely chopped along with onion and garlic. 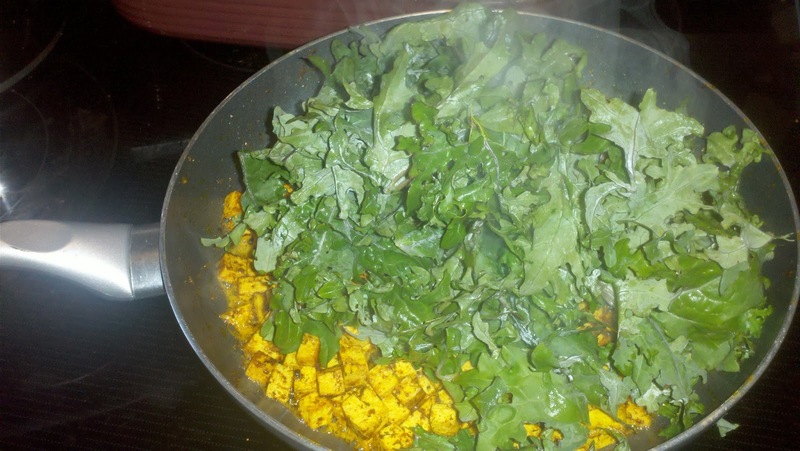 Once tender, add a handful of kale as well as the herbs and/or spices, cover the pan and let the steam tenderize the greens for about 5 minutes. Stir in tomato chunks and mushrooms. 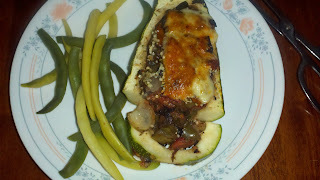 Stuff the zucchini boats. Sprinkle hemp hearts and then the cheese. Bake at 350F for 30 to 40 minutes in a baking pan with 1cm water at the bottom. 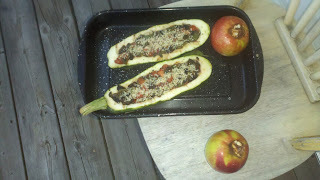 I baked mine atop a few sage leaves and alongside cored apples stuffed with whole pitted dates, walnuts and a chunk of butter - for dessert. Any of the leftover vegetable mix can be stirred in to 1/2 cup or more cooked quinoa, rice or beans and sprinkled with lime juice for a hearty salad or side dish for next day's lunch. Here are more luch leftover tips and ideas. Juice with a bunch of kale stems and leaves: red grapes, small beet, apple, celery, chunk of ginger and a lemon. Tell me about your Kale Kombos!